EcoClicker is a game where you have to save earth from global warming by planting trees. Please post in the forum if you experience any issue or for any feedback. Thank you for playing! 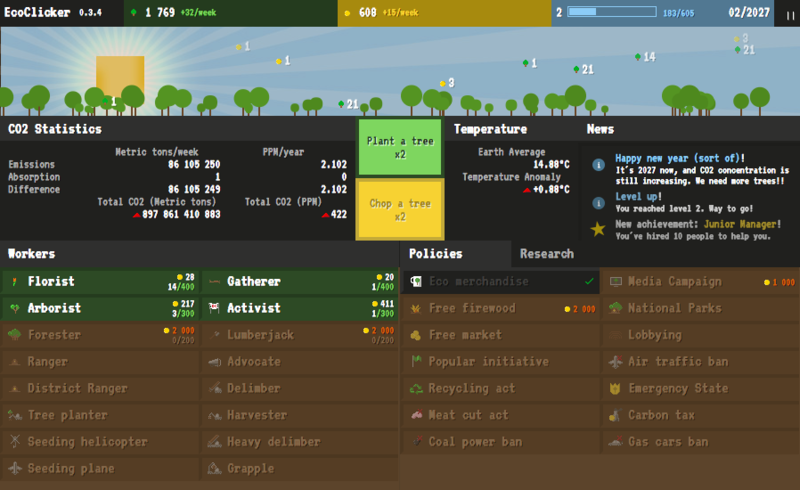 Click the big green button to grow some trees. The game is optimised/tested for Chrome but should work with all recent browsers (Firefox/Safari/Edge). "Eco Manager" research renamed "Permaculture"
Add "Eco dome" research. Buying it wins the game. The player shall not use the Enter key to plant and chop trees ultra fast! Added level up news. Cheer up!